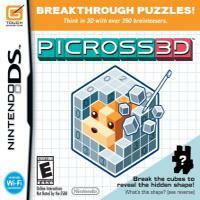 A game featuring a modified three-dimensional variant of Picross. Instead of a grid made of squares to selectively fill in to reveal an image, the player is presented with a rectangular prism made of cubes to selectively chip away to reveal an object. The clues work differently as well - not every row or column has clues, and the ones that do have a single number indicating how many cubes should be left in that row or column. The number is presented alone if the cubes are contiguous, circled if they are in exactly two contiguous groups, or in a square if they are in three or more contiguous groups. It’s a neat idea and a satisfying twist on the Picross formula that demands a new way of looking at puzzles and new strategies for solving them. However, the format comes with some limitations and concessions. While the 2D grids of standard Picross can easily be read as a whole, you can’t see an entire 3D Picross puzzle simultaneously. The game allows you to rotate the puzzle to view it from different angles, though you don’t have full freedom of motion on every axis. You can also slice the puzzle by temporarily hiding entire planes of cubes to reveal parts of the puzzle that are otherwise obscured, though you can only do this on two of the three axes which I’ve repeatedly found to be a frustrating limitation. Perhaps the biggest problem inherent to the three-dimensionality is that it would be extremely difficult to un-remove a cube, so the game simply doesn’t let you. Effectively, you’re locked in to playing with Normal rules. If you attempt to remove a cube that isn’t supposed to be removed, the game penalizes you with a “strike” and marks the cube as non-removable. If you get five strikes - or just take longer than the time the game has alloted for a given puzzle - you fail it and must start over. This punishment is a really bad idea and it’s what ultimately killed my interest in the game. In action games, it can be reasonable to ask the player to replay a section to achieve mastery of a skill. In puzzle games like this, replaying a puzzle you’ve already partially solved doesn’t require or improve mastery of a skill - you already have knowledge of which cubes to remove, probably a lot of it if you’ve run out the clock or managed to accumulate five strikes. Making the player do this again does nothing but waste their time. Given this omnipresent threat, I found the game far more stressful than I wanted it to be. This is especially true given the limitations on rotating and slicing the puzzle and the imperfection of the DS’s touchscreen - it’s not as difficult as it should be to accidentally tap on the wrong cube when you’re removing them, and it can take a long time to find the next part of the puzzle where you can progress. If the philosophy here were more like that of PICROSS e and you couldn’t fail a puzzle (or at least there were an option to turn off puzzle failure) I expect I would have had a much better time. I Stopped Playing When: After solving over a hundred of the game’s few hundred puzzles, the 3D gameplay was no longer quite so novel and the difficulty had increased to the point where I was constantly aware of the time limit while playing. That wasn’t the experience I wanted from this game, so I put it down.